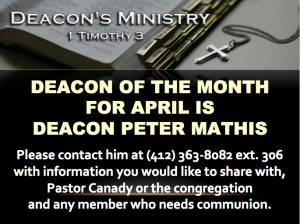 The Deacon on Call for the month of April is Deacon Peter Mathis. Please contact him at (412) 363-8082 ext. 306 with information you would like to share with, Pastor Canady or the congregation and any member who needs communion.